The other night my family and I got together with friends. We where watching the Swiss Family Robinson with all the kids in our friend’s backyard (outdoor movies are a super fun summer night tradition, btw). Ice cream sandwiches had been planned on so I had made some gluten free cookies for our family. Unfortunately they turned out pretty weird. I had a box of GF chocolate cake mix and decided to make cookies from it. I went online and found a recipe that had good reviews and I was pretty confident it would be good. Not horrible or anything, but kind of like dry cake, in a cookie form. Whatever, the girls liked them with a ton of strawberry sorbet on them. That said I wasn’t that excited about my ice cream sandwich. So, when one of my friend showed up with a container of caramel corn I was pretty excited. 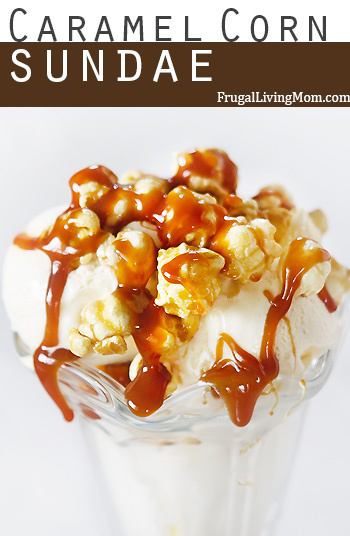 I had been wanting to make a Caramel Corn Sundae for about a month and here was my shot.. I didn’t have all the fixin’s there, except the caramel corn and ice cream, but it was great anyway, actually REALLY good. A couple other people even joined in with having one and we chatted about if caramel or chocolate sauce would be best for a sundae. Both sounded great. Today I headed to Trader Joe’s (which, just so you know has the best vanilla ice cream on the planet) for the ingredients. While I was there I polled some of the employees on which that though woudl be best. Everyone though chocolate would be great, but I should go with caramel sauce for the recipe. So I did.. and you know what?? It really does. To be honest, it’s a little TOO good. Let me know if you make it. I would LOVE to see your photos of this dessert! 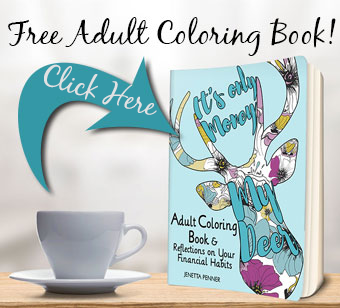 Post them to Instagram and tag #FrugalLivingMom, you can also let me know about your creation in the comments.